The Steno Keyboard Folio is designed for convenient portability with an interchangeable Plextonium hard shell feather case. The Steno™ Keyboard Folio is designed for convenient portability with an interchangeable Plextonium™ hard shell feather® case. 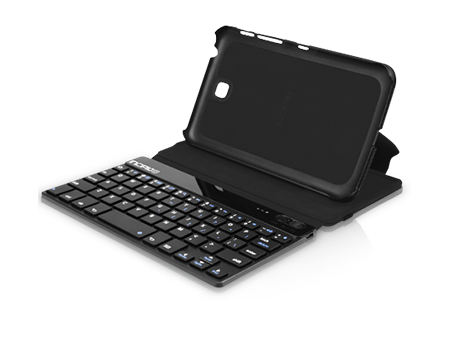 The innovative folio is crafted with a detachable Bluetooth® keyboard which enhances tablet usability. Remove the integrated ultra-thin Plextonium™ case from the folio using the quick release snaps to take the device on the go. Simply reattach your device to the folio cover and utilize the Bluetooth keyboard for long-form composition.